Fracture vs. Break: Is One Worse Than the Other? While many people believe that a fracture is a "hairline break," or a certain type of broken bone, this is not true. A fracture and a broken bone are the same things. To your physician, these words can be used interchangeably. While there are many types of fractures, or broken bones, there are other ways to describe fractures that give more specific meaning to the problem. Both of these words mean that the normal bone structure has been disrupted. This does not imply a certain type of treatment, but in general, bones heal best when immobilized. Therefore treatment of a broken bone may require some type of intervention. It is not uncommon for a physician treating the injury to be asked, "Is it a fracture or is it a break?" Answering this question can be challenging because, in the mind of your physician, these statements mean the same thing. A broken bone occurs because the amount of energy that the bone has to support is greater than the actual strength of the bone itself. This can mean that there was either a very high energy, a very weak bone, or an amount of energy over a long period of time that was too much for the bone to sustain. Too much energy. This means that the amount of energy being absorbed by the bone exceeds the strength of the bone. Common reasons for these types of fractures include falls, automobile accidents, and sports injuries. Too much repetitive stress. These injuries, also called stress fractures, occur not as the result of a single amount of force applied to the bone, but rather repeated stress to the bone—ultimately causing it to eventually fail. Much like you can bend a paperclip back and forth a few times and eventually it will snap, the same can happen with a bone. Stress fractures are often seen in people like long-distance runners and military recruits. Bone weakening. Some fractures occur not because of too much energy or too much stress, but because the bone has been weakened. These types of fractures (that occur in the setting of bone that has been weakened by an underlying condition) are called pathologic fractures. The most common pathology that weakens bone is osteoporosis, or bone thinning. Other causes of pathologic fractures include tumors, infections, and other bone disorders. Once a fracture has been identified, the proper treatment must be undertaken. Such treatment depends on a number of factors, including the type of fracture, the location of the injury, and the patient's individual needs. Casting or splinting. Most broken bones will heal with protection and immobilization. The best way to protect or immobilize a broken bone will vary depending on the bone that was injured. In many cases, a cast or a splint will be used to protect the injured bone and prevent it from moving. In some situations, the bone must first be reset (a procedure called a fracture reduction) if the bone is not aligned in its proper position. In this case, the individual with the fracture is given some type of anesthesia and the bone is then repositioned by the doctor. It is then held in place with a cast or a splint. Surgery. Surgery is used most often when the bone cannot be held in a proper position. Typically, some type of implant can be used to properly hold together the repositioned bone. These implants may include plates and screws, metal pins, or rods. 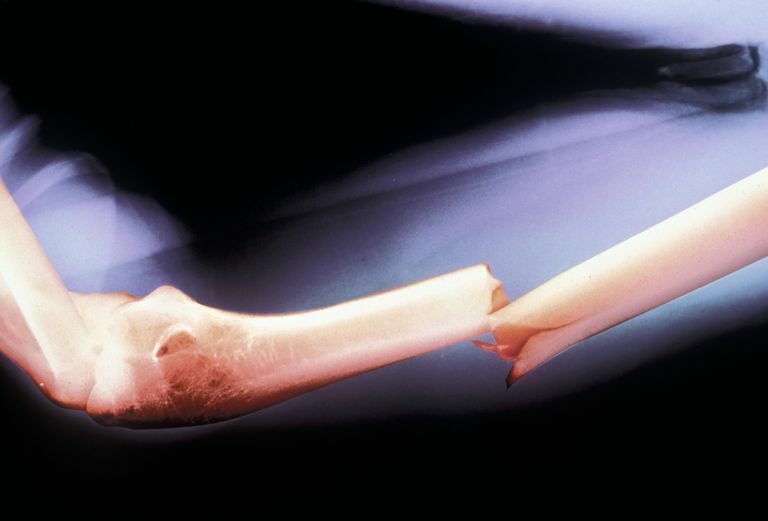 Broken bones may heal at different rates, and sometimes activity can even be resumed if the bone is not fully healed. Therefore, answering the question "how long does it take bone to heal?" can be challenging. The truth is, it depends. Bone healing is dependent on a number of factors, some of which you can control and others that are the result of the injury and your own body. If you want to do everything you can to heal as quickly as possible, you should follow your doctor's treatment recommendations carefully, eat a healthy diet, and avoid tobacco use entirely. Patients are often surprised to learn that the words fracture and break are used so interchangeably. However, this should not imply that all fractures are the same. In fact, there is essentially an unlimited number of different types of fractures, and each one may have specific circumstances that alter the recommended treatment. That's why the treatment of your fracture may be different from someone else's, even when it's the same bone that is injured. Once you have been diagnosed with a fractured bone, be sure you have a treatment plan that is clearly explained so you can have the best possible recovery from your injury. Fonseca H, Moreira-Gonçalves D, Coriolano HJ, Duarte JA. "Bone quality: the determinants of bone strength and fragility" Sports Med. 2014 Jan;44(1):37-53. What Are Pathologic Fractures and Why Do They Occur? What Causes an Elbow Fracture in Children? Does Your Child Have a Bone Fracture You Don't Know About? Will You Need Surgery If You Break Your Shin Bone?